The Ford Library has been serving up book reviews on this blog for 4 years. This week, in place of the standard fare is a salmagundi of summaries from 5 new books about business. Shows how Apple uses the power of simplicity in hardware, software, strategy, marketing and retail to make the company the most valuable on earth. Provides a fly-on-the-wall account of the Ford Motor Company’s turnaround, from the brink of bankruptcy to the most profitable automaker in the world. Recounts the lives of 9 female CEOs at Berkshire, beginning with Rose Blumkin, 90 year old manager of the Nebraska Furniture Mart; ending with Katharine Graham, publisher and chairman of the Washington Post. Distills the essence of Porter’s foundational work on strategy for managers – or for students who didn’t quite get it the first time. Also available as an audiobook. Presents an odd little tale about outsourcing Heaven and Hell to illustrate the basics of accounting and finance. Hamel, Gary. 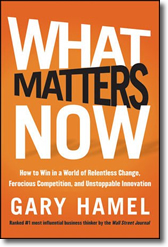 What matters now : how to win in a world of relentless change, ferocious competition, and unstoppable innovation. Jossey-Bass, 2012. The average business book is a Harvard Business Review article with extra examples, and the average HBR article is three PowerPoint slides with a lot more words. This irreverent quote is by one of the most respected business thinkers of our time, Gary Hamel. Hamel’s new book What Matters Now is a blueprint for creating successful organizations that reads like a series of brief HBR articles, illustrated with dozens of examples from companies and institutions. Hamel explains that in today’s business environment, where competition is brutal and change is relentless, there is a wide spectrum of challenges, but 5 critical issues are fundamental for companies to thrive: Values; Innovation; Adaptability; Passion; and Ideology. 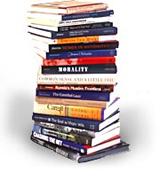 Hamel begins his book by discussing recent lapses in moral judgment in business and politics, and he calls for managers to regain the higher moral ground, to rededicate themselves to higher ideals. He then discusses innovation, which he calls “the only sustainable strategy for creating long term value.” He offers advice on retooling traditional management processes to foster innovation. Hamel explains that early management practice was designed to discipline and control the organization. Yet today’s resilient organization is flexible, constantly rethinking its strategy, redefining its core business and reinventing itself. It fuels passion in the customers who use the products and in the people who make them. Hamel outlines a management system where there is less hierarchy and more freedom. Since management itself is inefficient, he outlines a way to reduce the size of the traditional management layer by making management the responsibility of all employees. 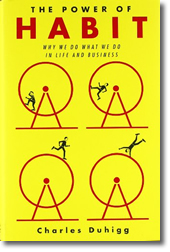 This thought provoking and optimistic book is recommended to anyone willing to view organizations in a new way. Duhigg, Charles. The power of habit : why we do what we do in life and business. Random House, 2012. Charles Duhigg, author of The Power of Habit, would not be surprised. Using recent research in brain science, Duhigg explains how a sequence of actions becomes automatic and a habit is formed. For every habit there is a three step loop — the cue, the routine and the reward. After repeating this loop a number of times, people begin to anticipate the reward. They crave the reward, which then powers the habit loop. Once this cycle is formed, it becomes resistant to change. But once the formula is known, it is possible to recognize a habit and to understand how to modify it. And conscious decisions to cultivate good routines can reprogram other bad habits. After discussing how personal habits are created and changed, Duhigg turns to habits in companies and organizations. He shows how leaders can transform their organizations by identifying keystone habits, those that change the dynamic throughout the organization. These leaders establish a culture where new values are engrained and change flourishes. Duhigg also discusses the habits of societies, explaining how social movements are created and maintained. The Power of Habit is an engrossing book. Author Duhigg weaves stories of people, companies and brands with studies of brain science to produce a work that is highly recommended for readers who want to transform their lives by making simple modifications. *So what happened during the Duke Moving Challenge? During the contest, it was fun to update our results on a website and to check our progress against other teams every day. But at the end of the contest, the website came down and we got rid of our pedometers. Our esprit de corps dissipated. For exercise novitiates, the reward was gone. Anyone already in the habit of exercising, however, had previously developed an intrinsic reward, the sense of accomplishment or the satisfaction of taking care of our health. These people continued to crave that emotional boost every day, contest or not, so it is no surprise that these people are still exercising. Also available in audiobook format. 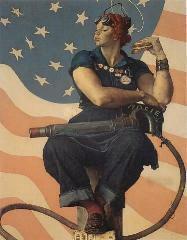 Ford Library will be open for our normal Semester / Term Hours on Labor Day, Monday, September 3rd. Our professional staff, and expert reference librarians will return on Tuesday, September 4th to help guide you toward success in your MBA.